Council Regulation (EC) No 1683/95 (2) laid down a uniform format for visas. 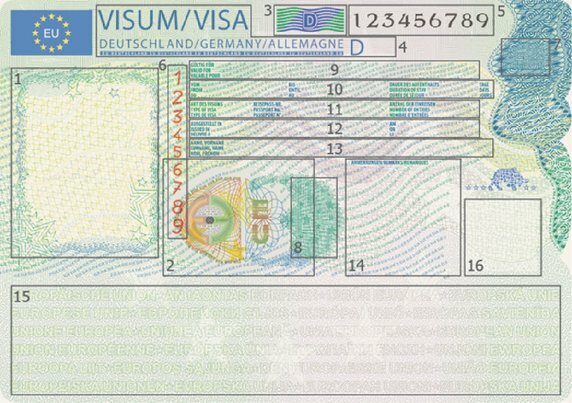 The common design for the visa sticker, which has been in circulation for 20 years, is considered to be compromised in view of serious incidents of counterfeiting and fraud. A new common design should therefore be established with more modern security features to render the visa sticker more secure and to prevent forgery. Upon request from Ireland or the United Kingdom, the Commission should enter into appropriate arrangements with the requesting Member State to exchange technical information with that Member State for the purposes of issuing national visas by that Member State. This Regulation respects fundamental rights and observes the principles recognised in particular by the Charter of Fundamental Rights of the European Union. This Regulation constitutes a development of the provisions of the Schengen acquis in which the United Kingdom does not take part, in accordance with Council Decision 2000/365/EC (3); the United Kingdom is therefore not taking part in the adoption of this Regulation and is not bound by it or subject to its application. This Regulation constitutes a development of the provisions of the Schengen acquis in which Ireland does not take part, in accordance with Council Decision 2002/192/EC (4); Ireland is therefore not taking part in the adoption of this Regulation and is not bound by it or subject to its application. TThis Regulation constitutes an act building upon, or otherwise related to, the Schengen acquis within, respectively, the meaning of Article 3(1) of the 2003 Act of Accession, of Article 4(1) of the 2005 Act of Accession and of Article 4(1) of the 2011 Act of Accession. As regards Iceland and Norway, this Regulation constitutes a development of the provisions of the Schengen acquis within the meaning of the Agreement concluded by the Council of the European Union and the Republic of Iceland and the Kingdom of Norway concerning the latters' association with the implementation, application and development of the Schengen acquis (5) which fall within the area referred to in Article 1, point B of Council Decision 1999/437/EC (6). As regards Switzerland, this Regulation constitutes a development of the provisions of the Schengen acquis within the meaning of the Agreement between the European Union, the European Community and the Swiss Confederation on the Swiss Confederation's association with the implementation, application and development of the Schengen acquis (7), which fall within the area referred to in Article 1, point B, of Decision 1999/437/EC read in conjunction with Article 3 of Council Decision 2008/146/EC (8). As regards Liechtenstein, this Regulation constitutes a development of the provisions of the Schengen acquis within the meaning of the Protocol between the European Union, the European Community, the Swiss Confederation and the Principality of Liechtenstein on the accession of the Principality of Liechtenstein to the Agreement between the European Union, the European Community and the Swiss Confederation on the Swiss Confederation's association with the implementation, application and development of the Schengen acquis (9), which fall within the area referred to in Article 1, point B, of Decision 1999/437/EC read in conjunction with Article 3 of Council Decision 2011/350/EU (10). ‘Upon request from Ireland or the United Kingdom, the Commission shall enter into appropriate arrangements with the requesting Member State to exchange technical information referred to in Article 2 for the purposes of issuing national visas by the requesting Member State. the Annex is replaced by the image and the text set out in the Annex to this Regulation. Visa stickers conforming to the specifications set out in the Annex to Regulation (EC) No 1683/95 and which are applicable until the date referred to in the second paragraph of Article 3 of this Regulation may be used for visas issued during a period of six months after that date. Member States shall apply this Regulation at the latest 15 months after the adoption of the further technical specifications referred to in Article 2 of Regulation (EC) No 1683/95. (1) Position of the European Parliament of 1 June 2017 (not yet published in the Official Journal) and decision of the Council of 20 June 2017. (2) Council Regulation (EC) No 1683/95 of 29 May 1995 laying down a uniform format for visas (OJ L 164, 14.7.1995, p. 1). An integrated colour portrait of the holder shall be produced to high security standards. A diffractive optically variable device (“Kinegram” or equivalent) shall appear in this space. Depending on the angle of view, the letters “EU”, “EUE” and kinematic guilloche lines shall become visible in various sizes and colours. This box shall contain the three-letter country code as set out in ICAO Document 9303 on machine-readable travel documents of the issuing Member State, or the acronym “BNL” if issued by Belgium, Luxembourg or the Netherlands, in optically variable colouring. Depending on the angle of view, it shall appear in different colours. the three-letter country code of the issuing Member State, as set out in ICAO Document 9303. This box shall contain the nine-digit national number of the visa sticker in horizontal orientation, which shall be pre-printed in black. A special font type shall be used. This box shall contain the nine-digit national number of the visa sticker in vertical orientation, which shall be pre-printed in red. A special font type shall be used, different from that used in box 5. The “number of the visa sticker” is the three-letter country code as set out in ICAO Document 9303 and the national number as referred to in boxes 5 and 6. This box shall contain the letters “EU” with a latent image effect. Those letters shall appear dark when tilted away from the viewer and light when then turned by 90°. This box shall contain the code as referred to in box 3 with a latent image effect. That code shall appear dark when tilted away from the viewer and light when then turned by 90°. The captions for the boxes shall appear in English and French. The issuing Member State may add a translation in another official language of the institutions of the Union. This box shall begin with the words “valid for”. The issuing authority shall indicate the territory in which the visa holder is entitled to travel. This box shall begin with the word “from” and the word “until” shall appear further along the line. The issuing authority shall indicate the period of the visa holder's stay as authorised by the visa. Further along the line the words “duration of stay” (i.e. the duration of the applicant's intended stay) and again “days” shall appear. This box shall begin with the words “type of visa”. The issuing authority shall indicate the category of visa. Further along the line the words “Passport No” and “number of entries” shall appear. This box shall begin with the words “issued in” and shall be used to indicate the location of the issuing authority. Further along the line the word “on” (after which the date of issue shall be filled in by the issuing authority) shall appear. This box shall begin with the words “Surname, Name”. This box shall begin with the word “remarks”. The area below the word “remarks” shall be used by the issuing authority to indicate any further information. This box shall contain the relevant machine-readable information to facilitate external border controls. The machine-readable zone shall contain a printed text in the visible background printing with the words “European Union” in all the official languages of the institutions of the Union. This text shall not affect the technical features of the machine-readable zone or its ability to be read. This box shall be reserved for the possible addition of a common 2D barcode.